Churachandpur is a town located in Indian state of Manipur. This town is locally known as Lamka, which means the ‘place situated at a road junction’. This town has a deep historical significance. When the Japanese entered India through North East, this town witnessed a lot of bombarding. It was left devastated. It took fifty years to reconstruct this town and that’s when it became a peaceful town in Manipur. It is a beautiful city surrounded with narrow valleys and small hills. It is located 59 kms from the capital of the state, Imphal, therefore travel is not a problem. It is well connected via flights, rails and roads. However, one has to travel to Imphal to catch a flight. Listed below are five of the best spots of Churachandpur. Ngaloi is a small village located at a distance of 9 km from Churachandpur. Its original name is Ngaloimoul. This surreal village was founded in 195 by Jangkhohen Haokip. Telsing family of the Haokip clan has been residing here since the 16th century. 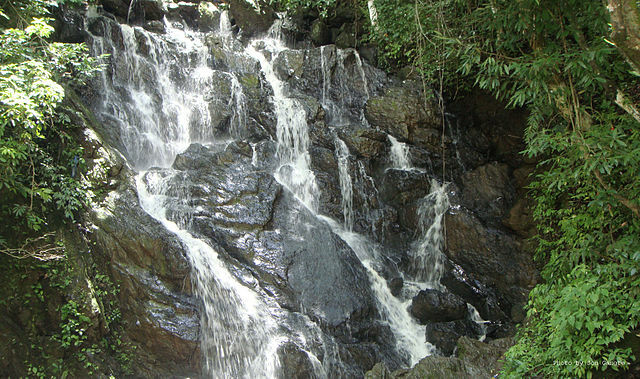 It is a popular tourist attraction because of the Ngaloi Waterfall. The low lying mountains and the greenery provide the perfect background for the magnificent cascading waterfall. The white foamy water gushing down the dark rocks is accompanied with the cool breeze of the mountains. It is located just a few kms away from Churachandpur. Tipaimukh is a popular spot for the nature lovers. It is where the two rivers, Tuivai and Barak meet. The name Tipaimukh comes from two words – Tipai which means river and mukh meaning mouth. This beautiful scene of the confluence of rivers is complimented with the green low lying hills. Boating is an option here. Some people even prefer taking long walks along the bank of the river, absorbing the scenic beauty. Tribal museum is a place for people who are interested in the history of this town. It gives them a detailed knowledge of the early human settlements and the tribal lifestyle of the people of this region. Though it is not a very huge museum, it has a decent collection of antiques that once belonged to the traditional tribal people. These include the tribal costumes, religious accessories, cane and bamboo crafts and many other cultural artifacts. The museum also has a wide variety of old ornaments and weapons. The state of Manipur is known for its natural attractions as well as the caves. As might be known to many people, it has an array of historic caves that not only serve as tourist attractions but also as an important link for the archaeologists to trace back the history of the region. Tonglon caves are the most famous caves of Churachandpur. They are regarded as one of the best cultural and historical highlights of the town. The carvings and sculptures present at these caves give one a good insight of the early settlements. The scripts and engravings found here helped many historians to understand about the past of Manipur. The best time to visit Churachandpur is between the months of October and March. This town is also an important commercial hub of the state. Weaving and animal husbandry is quite common here. One must visit Churachandpur at least once in their entire lifetime and we are sure you would not regret it.